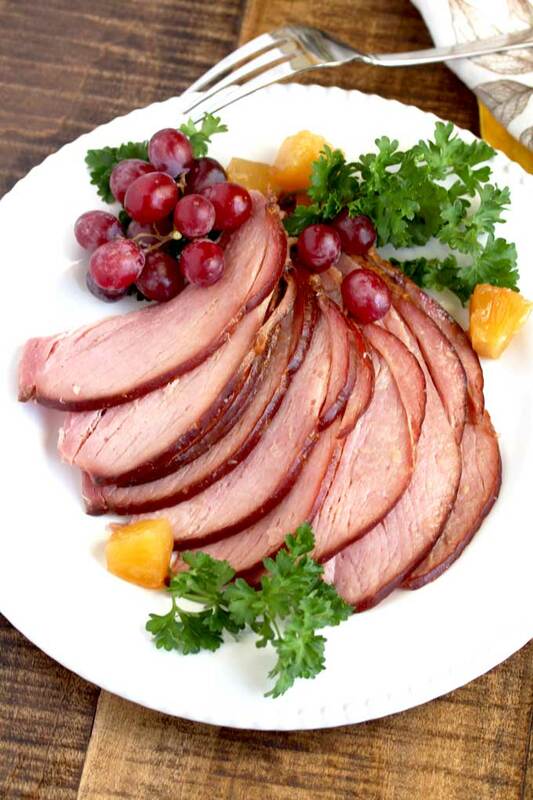 This Slow Cooker Ham is tender, juicy, tasty and perfect for the Holidays! 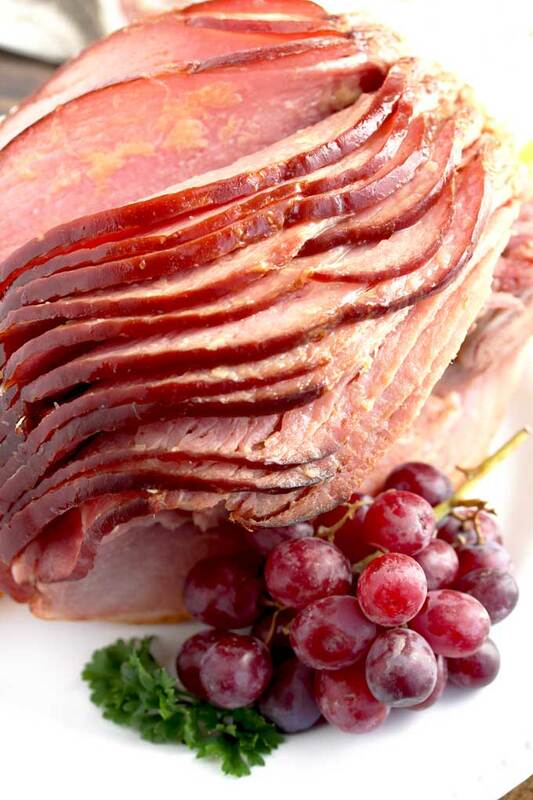 This easy Crock Pot Ham requires minimal prep, a few ingredients and saves you oven space! 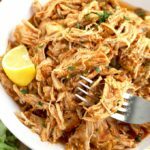 Whether you are making a Thanksgiving Ham, a Christmas Ham, or an Easter Ham – this crock pot recipe is a keeper! 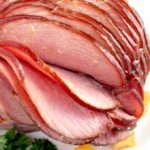 This Slow Cooker Ham is made effortlessly in the crock pot while you concentrate on other parts of the meal. As a bonus, you can keep your ham warm in the slow cooker until you are ready to serve it. Talk about entertaining made easy! 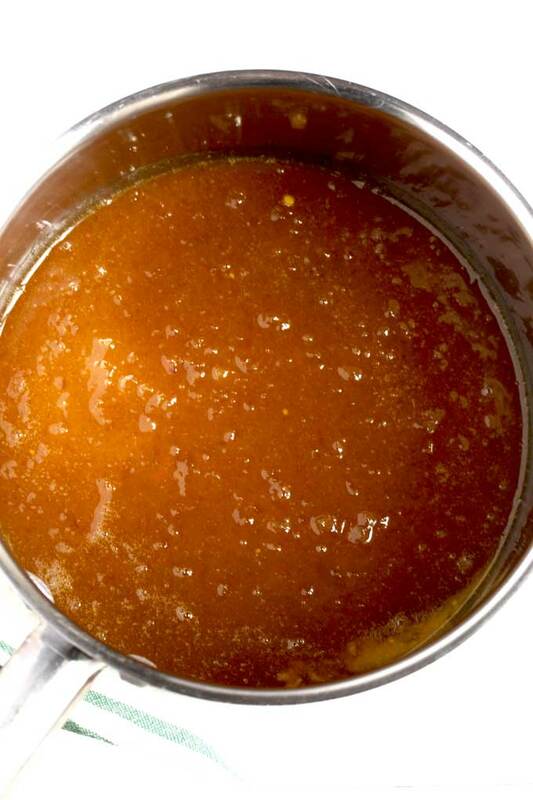 The simple Brown Sugar Pineapple Glaze only takes a few minutes to make (if you can warm up 5 ingredients in a pot, you got this!). The combination of the sweet glaze with the savory and smoky ham is pure perfection! 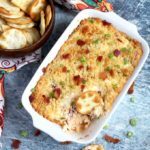 This succulent and tasty ham is one you will make over and over again during the holidays or for any special gathering. Now lets talk about Ham! In this post, I will try to answer the most common questions I get about all things ham. What are the Types of Ham Available? How Long To Cook a Ham in the Crock Pot? Why to Cook Ham in a Crock Pot? What to do with your Leftover Ham? JUST TAKE ME TO THE SLOW COOKER HAM RECIPE ALREADY! 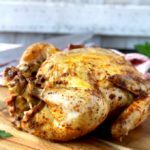 If you would rather skip my tips, tricks, essential cooking information and similar recipe ideas and get straight to this delicious Slow Cooker Ham with Brown Sugar Pineapple Glaze recipe – simply scroll to the bottom of the page where you can find the printable recipe card. But, you may be missing out on some good stuff! There are three types of ham. City Hams, Country Hams and Fresh Hams. City Ham: The most popular variety of hams sold in American supermarkets. They are “wet cured” or injected with a wet brine. They are also often smoked and fully cooked. They come bone-in or boneless. Country Ham: These hams are dry-cured with salt and spices, then aged for months to years. Their flavor is concentrated and a bit salty. Some are also smoked. They are sold both cooked or uncooked. Country Ham is very popular in the south, usually served with biscuits and gravy. Fresh Ham: These are sold raw for you to cook at home or to cured. They are the rear leg of the pig. To make this recipe or any other holiday ham, you want to get a City Ham. Since that answer doesn’t seem like a lot of help due to the fact that supermarkets go into ham overload during the holidays – I will make it simple for you, You want to get a Fully Cooked, Bone-In, Spiral Ham. Fully Cooked: Since they are safe to eat out of the package, fully cooked hams only require a bit of warming up. Of course, we like to dress them up for the holidays with a fabulous ham glaze! Some hams bring a glaze package but I love making my own. Bone-In: Bone-In Hams are more flavorful and are easier to keep juicy. They also have a better texture than boneless ham (boneless hams are pressed into an oval shape, just like ham you buy at the deli). As an added bonus, you can use the ham bone to flavor beans or in recipes like this Pressure Cooker Split Pea and Ham Soup or this Slow Cooker Ham Bone and Navy Bean Soup. Spiral Cut: These bone-in hams are thinly sliced for your convenience. 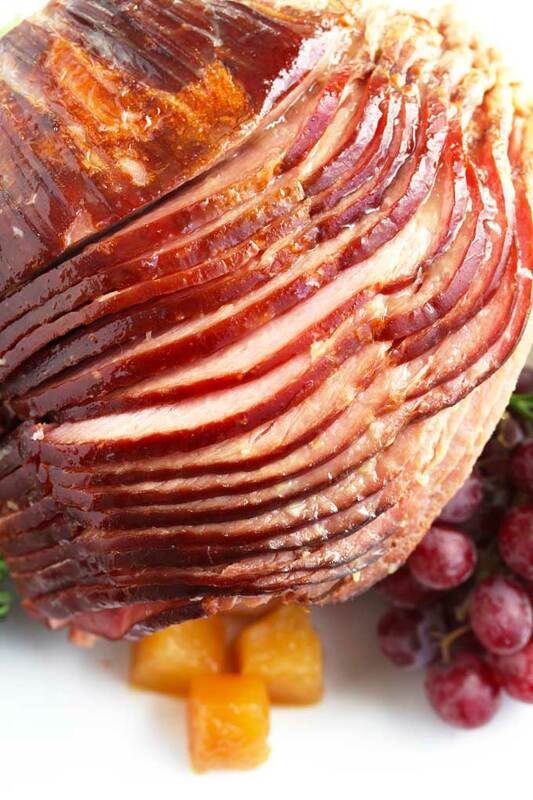 If you are using a glaze for ham, you can brush the glaze in between the slices to add extra flavor. Estimate about 3/4 pound of bone-in ham per person. You can increase it to 1 pound so you have plenty of leftovers. 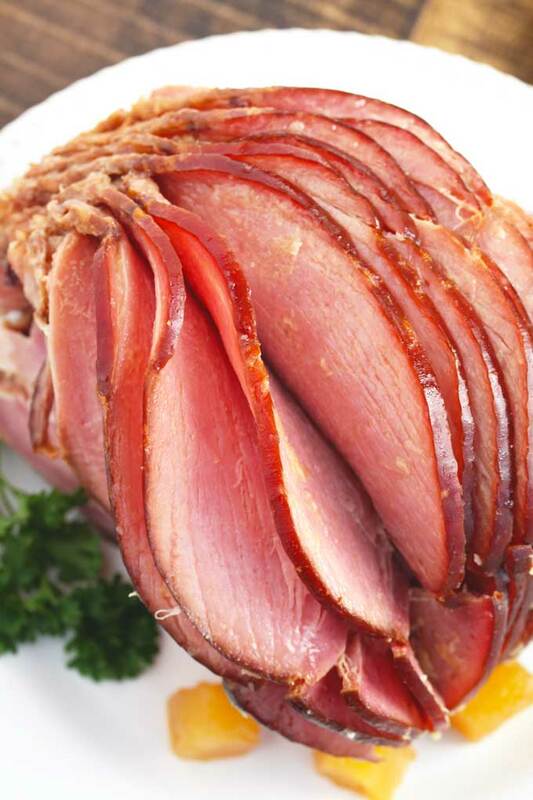 If using a boneless ham, you will need 1/2 pound per person. How Long To Cook Ham in a Crock Pot? Cook your ham in the crock pot for about 3 to 4 hours on low. 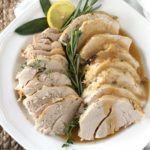 This time is sufficient for your slow cooker ham to get heated through without getting dried up. Keep in mind that you are preparing a “fully cooked ham” so all you are doing is warming it up. Although your fully cooked ham is safe to eat at any temperature, you can check if it’s warm enough by using an instant-read thermometer. I serve my ham when the internal temperature has reached 140 degrees. At this point, you can turn the slow cooker to warm. No use of oven space! This is huge for people with one oven in their kitchen. Especially if you are also serving a Roasted Turkey for the holidays. Ham cooked in the slow cooker keeps moist. 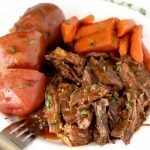 Put the ingredients in the slow cooker and forget it! No baby sitting (ham sitting) or basting is required. What to Do with the Leftover Ham? 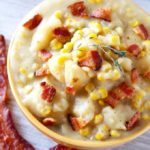 This Slow Cooker Ham cooks smothered in the tastiest, most delicious and easy to make ham glaze! 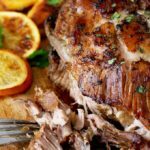 The Brown Sugar Ham Glaze is sweet and tangy and not only gives this ham delicious flavor but also a nice caramelized color and shine. 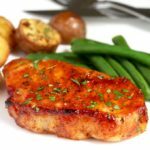 Because ham already has a lot of smokey and savory flavors going on, I keep this ham glaze recipe very simple. Brown sugar, Dijon mustard, pineapple preserves, pineapple juice or water and garlic power is all that is needed to make this ham glaze recipe. Since the recipe calls for a small can of pineapple chunks in juice, I drain the fruit and save the juice to be used in making the glaze. No need to buy pineapple juice. If you decide to skip the pineapple chunks (although I know you will love them, they get extra sweet and caramelized and are melt in your mouth delicious), just use water instead. 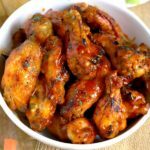 Place all the glaze ingredients in a pot and warm them up until all the ingredients are melted and meld together into a glaze. I like to brush the pineapple glaze in between the ham slices to make sure the ham gets lots of extra flavor. 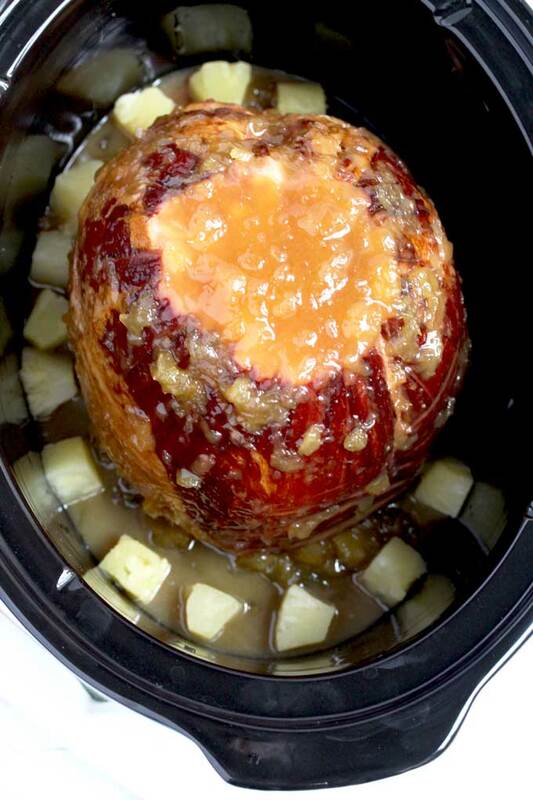 WANT TO TRY THIS SLOW COOKER HAM WITH BROWN SUGAR PINEAPPLE GLAZE? 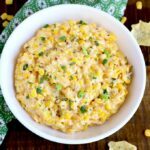 PIN IT TO YOUR MAIN DISH, SLOW COOKER OR HOLIDAY BOARD TO MAKE IT LATER!! 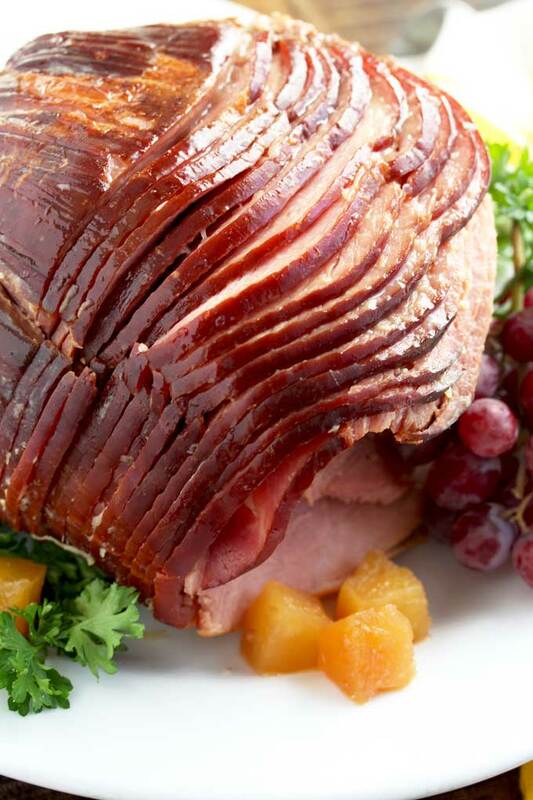 This Slow Cooker Ham is tender, juicy, tasty and perfect for the Holidays! This easy Crock Pot Ham requires minimal prep, few ingredients and saves you oven space! 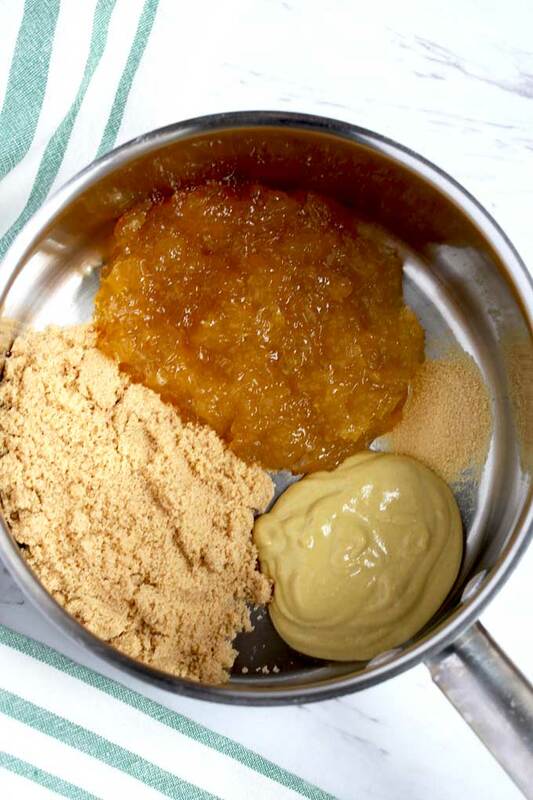 In a small pot over medium-low heat, combine the brown sugar, pineapple preserves, Dijon mustard, pineapple juice or water and garlic powder. Warm to form a glaze. Sprinkle 1/4 cup brown sugar in the bottom of a 7-8 qt slow cooker. Place the ham into the slow cooker cut side down. Place the pineapple chunks all around the ham. Brush the ham with the glaze trying to get in between the layers. Pour the remaining glaze over the ham. Cover and cook on low for for 3 hours. Transfer to a platter and serve with the glaze and pineapples. You can also keep the ham warm in the slow cooker until ready to serve. The recipe calls for 3 tablespoons of pineapple juice or water. I use the reserved juice from the canned pineapple chunks. Nutrition facts is just an estimate and will depend on the product brand you use. 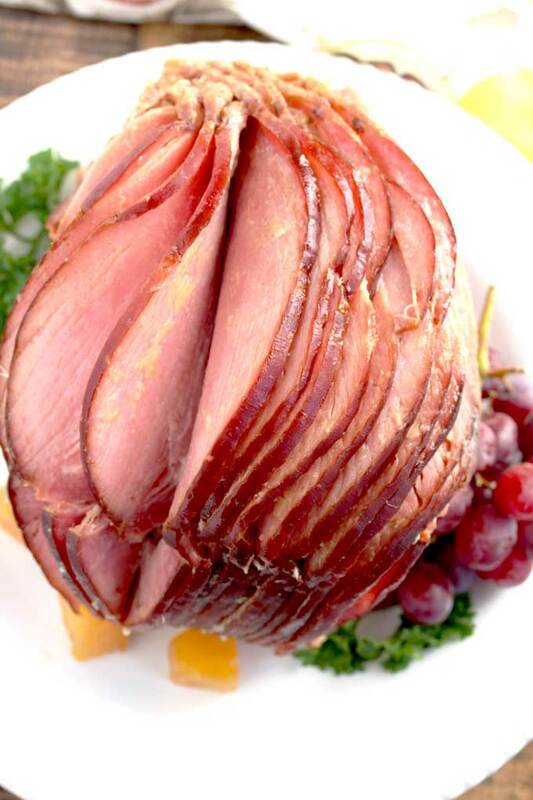 This ham looks amazing! I love how simple it is to make. Thank you for explaining the differences between the hams available at the market. It can get a bit overwhelming during the holidays. It seems there are always too many options. Hi Carole, I haven’t try cooking this recipe in a pot on the stove top so I cannot recommend it. I think the oven would be a better option. 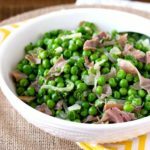 We love ham and this recipe is just in time for our Easter table!